DAY-01- Arrival at nearest Bagdogra Airport or New Jalpaiguri railway (train) Station transfer to Darjeeling about 90 kms, 3 hours drive by luxurious vehicle. Arrival at Bhadrapur / Biratnager Airport (Nepal) Transfer to Darjeeling about 5 hours drive by luxurious vehicle. A journey to Darjeeling is beautiful experience. The road passes through lush green forest, teagardens, mountain views, water falls, Mountain River and more. A complete journey to Darjeeling a delightful experience simply out of the world. Darjeeling (2134 m) known the world over as the Queen of Hills, The cool climes of Darjeeling provide welcome relief and delightful experiences around every corner. This is the land of World Heritage Darjeeling Himalayan railway (Train). It is divers and vibrant culture where the legendary Gorkhas are in harmony with the smiling Lepchas, Sherpas and Tibetans. Nestled among the rolling mountains with the glistening Mt. Kanchanjunga towering over the azure sky. O / N at hotel in Darjeeling. DAY-02- Morning session: Early in the morning you shall start your day for morning sunrise view. 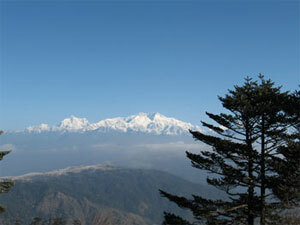 Drive to Tiger hill (2590 m) 11kms from Darjeeling town, it will take one and half hours drive. To see the morning sun rise ,no finer place exists of provide a view of grandeur and beauty of towering snow capped mountains, Mt. Everest, Mt. Kanchanjunga, whole eastern to western Himalayas peak is also visible from this point. Tea / breakfast on the way. Visit famous Yiga Choling Buddhist Monastery, This monastery situated at an altitude 8000ft, This monastery to belonging to the yellow sects of the Buddhist who worship a 15 ft statue of the coming Buddha, it was built in 1875. Return to the hotel for lunch. Afternoon session: After lunch session, takes you for casual walk / leisure. Visit Himalayan Zoological park, about 3kms walking distance, this is altitude wild part with Siberian tiger, Snow leopards, Himalayan black bear, red panda and more. Himalayan Mountaineering Institute (museum & Art galleries of Himalayan mountaineering Institute) Tenzing Norgay ascent of Mt. Everest along with Edmond Hillary in 1953 provided the impetus of mountaineering as an organized spot in India. Lunch at hotel and over night in hotel at Darjeeling. Return to the hotel. O / N at hotel in Darjeeling. DAY-03- After breakfast drive to Manaybhanjang (2134m) 23 kms, 2 hours drive, tea break, and refreshment. Same day trail to uphill Tonglu (3070 m) 11 kms, 5-6 hours trek, it leads through the green forest and small village country sight. Lunch enroute and over night stay in trekker hut at Tonglu. DAY-04- Trail downhill Gairibas (2621 m) 9 kms, 3-4 hours trek. The route passes through bamboo glades and quaint little village inhabited by warm and friendly people. Over night in trekker hut at Gairibas. DAY-05- Trail Gairibas to uphill Sandakphu, (3638 m) 12 kms , 6-7 hours trek. It is the steepest climb and most challenging in terms of steepness but it is also the rewarding and exhilarating one. Road passes through thick magnolia and rhododendron forest ultimately leading one to Sandakphu denoting the height of the poison plant. the magnificent panoramic view of whole western to eastern Himalayan range, Mt. Everest, Lotse, Makalu(in Nepal) Mt. Kanchanjunga and Mt.Pandim (in Sikkim) can be seen clearly. The most famous Singalila trek along the Indo- Nepal border, the Sandakphu trek is undoubtly the most popular trek of the Darjeeling area also the must rewarding one as it offers the most enthralling view along with a maximum dosage of flora and fauna. Lunch enroute and over night stay at Sandakphu. DAY-06- Trail to Slope hill Phalut (3600 m) 21 kms, 7-8 hours trek. The route passes through the silver fir forest make a beautiful sight, magnolias rhododendrons, chestnut, oaks and other alpine trees proclaim their existence as if suddenly emerging out of the mist. It is a northern most point of trek of the trek at Phalut. The Kanchanjunga range looks much larger and closes than at Sandakphu. Over night in trekker hut at Phalut. DAY-07- Trail to down hill Rammam (2560 m) 13 kms away from Phalut, it will take 5 hours more. The route passes through green vegetable and country village sight, it is natural quite environment. Over night at Rammam. DAY-08- Trail slope hill Sri Khola about 5 hours trek, route leading narrow trek and passes through county village. Over night stay at Sri Khola. DAY-09- Trail slope hill Rimbick (2286 m) about 3 hours trek. It is a last destination of Sandakphu and Phalut trek. Rimbick is most peace and ideal place. Over night stay at Rimbick. ( End your Trek). DAY-10- After lunch return to Darjeeling. Over night at hotel in Darjeeling.